The final table of Event #46 ($5,000 Pot-Limit Omaha Hi-Lo) during an early all-in situation. 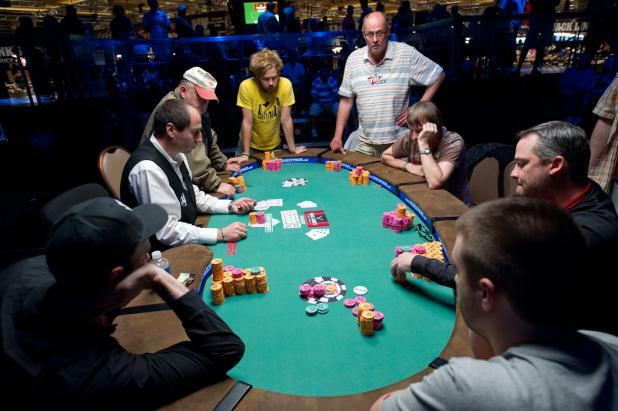 The final eight players, in seat order, clockwise from the dealer: (1) Perry Green, (2) Leif Force, (3) Rob Hollink, (4) David "Devilfish" Ulliott, (5) Dan Shak, (6) Chris Bell, (7) Joe Ritzie, and (8) Erik Seidel. 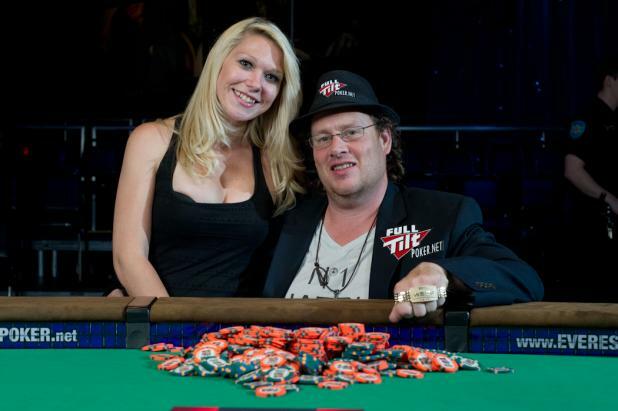 Gavin Smith poses with his new WSOP bracelet and his girlfriend Kayce (pronounced like "K.C. "), who is pregnant with their first child. Smith said, "I'm just an older guy from Guelph, Ontario, who used to drive a taxi and cut greens. Now, I'm sitting here and hundreds of people have come over to me. I play poker for a living, and I just won hundreds of thousands of dollars. There is nothing in my life that can be considered a curse. Every single minute of it is a blessing." 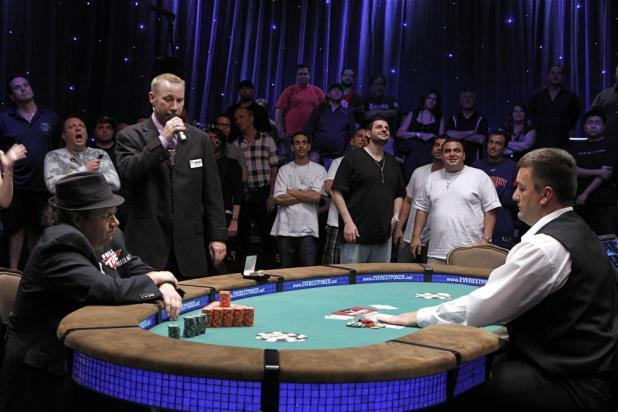 When asked about his first WSOP bracelet, Smith said, "It doesn't change things. It doesn't change who I am. I'm going to come back again tomorrow and start over. But what it does mean is that I'm part of that club that I always wanted to be a part of." While WSOP Media Director Nolan Dalla (right) congratulates every player who wins a WSOP bracelet before conducting the official post-final table interview, this night was special. 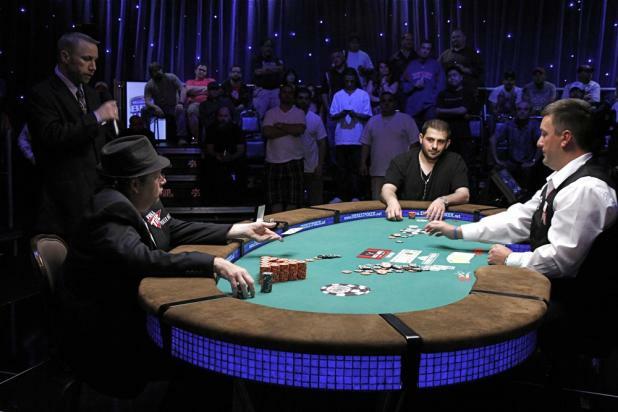 Dalla had known Gavin Smith since his earliest days as a professional poker player on the East Coast. 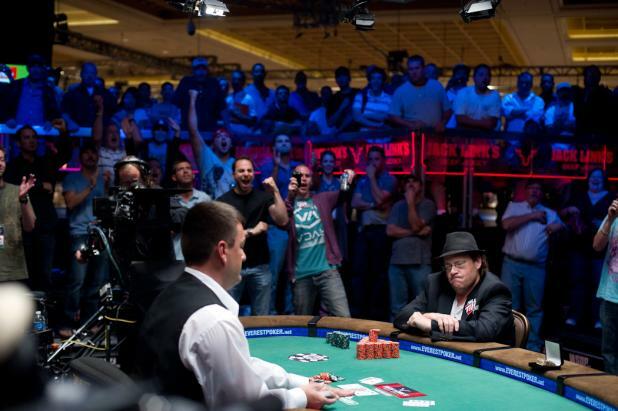 When a WSOP event ends, there is usually a flurry of activity as photographers take the official winner's photos and WSOP Media Director Nolan Dalla interviews the winner for the official report. 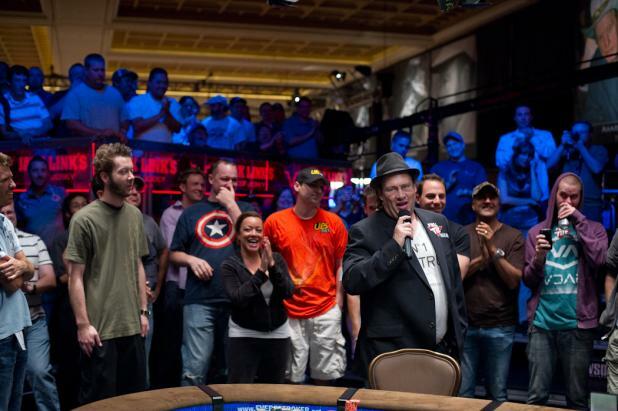 But this night was special for Event #44 ($2,500 Mixed Hold'em), and Gavin Smith was given a microphone to address the crowd. Smith had tears in his eyes and was unable to speak for a few moments as he got caught up in the emotions of the moment. The first thing Smith did was congratulate runner-up Danny Hannawa for a good performance, and then he thanked Erick Lindgren, who has always supported Smith throughout the ups and downs of his career. 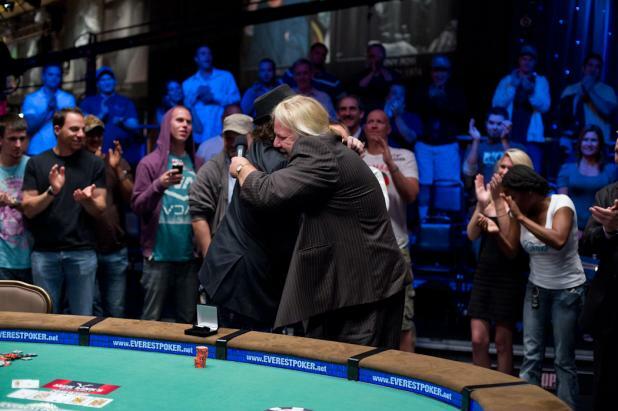 Danny Hannawa missed his straight draw on the river, and Gavin Smith won the pot, the tournament ($2,500 Mixed Hold'em), and his first WSOP bracelet. 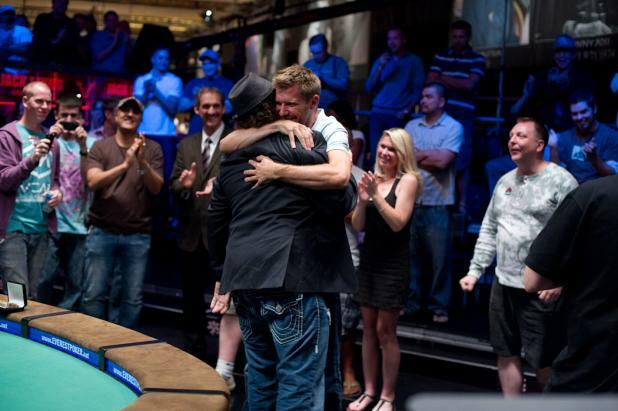 The first one to congratulate him was his close friend Layne Flack, who has six WSOP bracelets in his career. Danny Hannawa (center, standing in the black shirt) was short-stacked and all in preflop with 10-8 against Gavin Smith's A-Q suited. Smith flopped a pair of aces to take the lead, but Hannawa picked up a gutshot straight draw on the turn. Hannawa was standing with his friends on the rail watching the overhead monitors as they waited for the river card in what could be the final hand of Event #44 ($2,500 Mixed Hold'em). In the final hand of Event #44 ($2,500 Mixed Hold'em), Danny Hannawa was all in preflop with 10-8 against Gavin Smith's A-Q suited. Smith's friends in the crowd begin celebrating when an ace on the flop gives Smith a big lead in the hand. For his part, Smith just gives himself a subtle fist pump. The key hand of Event #44 ($2,500 Mixed Hold'em) came during a limit hold'em round. With the board coming 8h-4s-2s-Kd-10c, Gavin Smith fired on every street with top pair, middle kicker, confident that it was good even when two overlords came behind. We have no idea what Danny Hannawa had, but you can be sure this hand would have played out much differently if it had been a no-limit hold'em round. Losing this pot crippled Hannawa's stack down to less than a single big bet. The key hand in the heads-up battle in Event #44 ($2,500 Mixed Hold'em) came during a limit hold'em round. The final board showed 8h-4s-2s-Kd-10c, and Gavin Smith (left) check-raised the flop before betting the turn and the river. The limits were very high, and Hannawa made the calls, putting most of his stack into the pot. 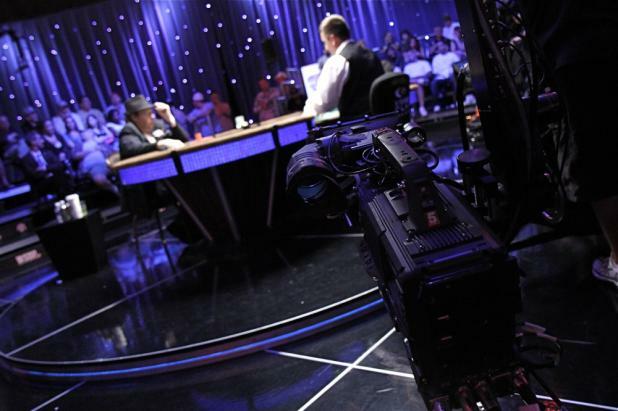 In addition to the rolling cameras around the final table, the overhead crane cam was also in use for the live webcast of Event #44 ($2,500 Mixed Hold'em). 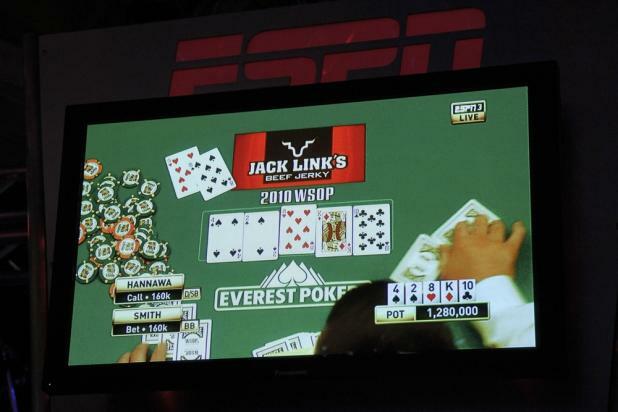 With a very popular player like Gavin Smith going for his first WSOP bracelet and a full production crew recording the final table, it received the star treatment from ESPN.